Operators in the highly regulated nuclear sector face a multitude of high-risk challenges, from safeguarding waste materials to securing both generating and non-generating sites against intrusion. Integrated security solutions specialist, Quadrant Security Group (QSG), has first-hand knowledge of this, having supported multiple nuclear-licensed sites in the UK with systems that effectively mitigate and manage these risks. QSG shared its valuable insight and advice with visitors attending the Nuclear Decommissioning Authority’s (NDA) Estate Supply Chain Event, at EventCity in Manchester. One aspect under scrutiny at nuclear facilities is having suitable mastering procedures in place to ensure the safety of personnel in the event of an incident – being able to manage incidents and control the movement of people is essential and requires the implementation effective emergency procedures. There are numerous technologies available to support effective evacuation and mustering, from access control systems that automatically shut down unmanned areas, thermal cameras that can identify lone workers and tracking devices that combine radio-frequency identification (RFID) and GPS for real-time visibility of personnel. However, the key is selecting the right technologies as part of an integrated solution to meet best-practice mustering procedures. Mark Pennington, Managing Director at QSG, commented: “We work with our customers to conduct a complete assessment of their site and processes to produce an appropriate risk-based design. This means looking at the complete security landscape, from risk, to process, to cost, in line with regulatory standards, ensuring the design is optimised for lifecycle management. 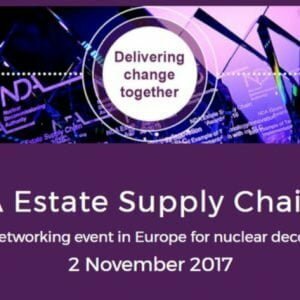 Now in its 8th year, the NDA Estate Supply Chain Event has established itself as a hub of networking activity between operators, business leaders, key stakeholders and influencers in the nuclear decommissioning supply chain.